Ishqbaaaz, one of the popular shows of Star Plus' has been surrounded by controversies but despite this fact, the audience still loves to watch the show onscreen. In the last night's episode of the show, the audience as well the Oberoi family received a shock from Priyanka. The episode began with Anika preparing food for the family which she later asks his brother Sahil to help her in giving khichdi. During that time, she notices Shivaay's watch on his wrist and asks him about the same to which he lies and says that Shivaay himself has given him the same. Everyone in the house is waiting for Anika to announce about the breakfast which she does but Shivaay is still wondering as to where Priyanka is. The three brothers Shivaay, Rudra and Omkara are seen talking around and at that time Priyanka arrives, not alone but with her boyfriend Rajeev. Everyone sees them holding hands and at the same time she announces that he is the man whom she wants to marry. ALSO READ: Ishqbaaaz: Anika aka Surbhi Chandna and Nakuul Mehta's sizzling suhaag raat video goes viral on the internet; have you seen it yet? Everyone gets shocked and her brothers do not agree with her decision. Rajeeev tells everyone that he is a call center employee and later faces judgments from everyone who call him a gold digger. Priyanka responds over the same and disrespects Anika, Gauri, and Bhavya and says that they too are gold diggers in that case. She asks Omkara and Rudra not to interfere in her matter since they are not her real brothers later which she gets a tight slap from Dadi who asks her to mind her tongue. Shivaay asks Rajeev to leave their house and later calls for Khanna. Priyanka, who gets upset rushes to her room and starts breaking things, shouting and threatening everyone that she would kill herself. Everyone reaches outside her room and ask her to understand and stop but she does not listen to anyone and breaks down claiming that no one cared for her except for Rajeev when Shivaay Rajeev for five years. Anika understands her condition and asks everyone to leave her alone for some time. 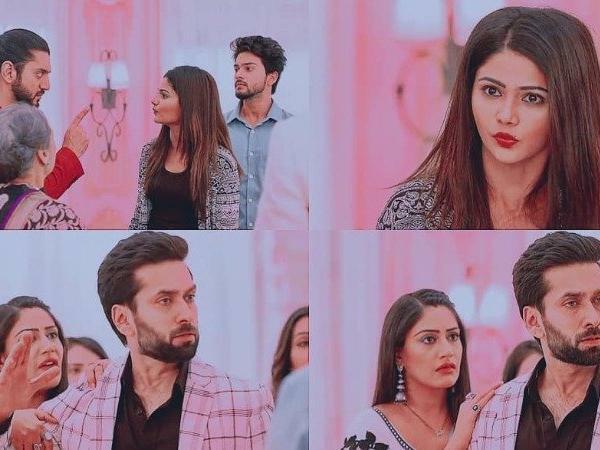 After all the fiasco, Shivaay feels guilty that he was unable to give attention to her sister and Rajeev to Anika that her first ritual as a married woman got spoiled because of all this. Gauri and Bhavya decide to send food to her room arrives witness that she has been packing bags to leave the house. Priyanka refuses to eat and at the same time Anika arrives and tries to calm her down and make her eat food but received only insult and anger from her. For more updates about the show, stay tuned to us.